We're in the middle of a pop punk renaissance. New recruits are signing up left and right and firing off catchy odes to the evergreen vagaries of romance, teenage or any age. But this is a post-Lifetime era, so for the most part today's young turks eschew the Ramonesianism of a Screeching Weasel or a Queers in favor of the chunky guitars and wistful sing-alongs of New Jersey's most-decorated. The name of the game is no longer brain damage as a metaphor for love, but spin kicks and windmills as a backdrop for plaintive pathos. So where does this leave a band of staunch classicists like the Lillingtons? Emerging out of coal-rich Wyoming in the mid-1990s, the Lillingtons celebrated the fin de siÃÂ©cle in 1999 by unveiling one of the best pop punk albums since the heyday of Screeching Weasel, Death by Television. Two years later, they released the espionage-themed and decidedly minor key offering The Backchannel Broadcast (which had one whoa-heavy sing-along gem, "Wait It Out", buried ten songs deep in the album) and called it quits. But in 2006, the original lineup is back together with a new album, entitled The Too Late Show. 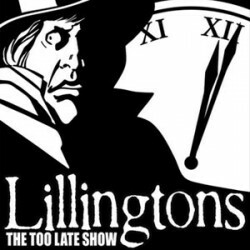 The Lillingtons have a sound that can generously be described as traditionalist: their songs are punchy bass/drums/guitar salvos laden with gold-plated hooks and commanded by vocalist Kody Templeman's instantly recognizable and pitch-perfect croon. Their sound is that of the classic rock and roll band as delimited by Joe Carducci: so simple it can't be faked, and seemingly capable of infinite variations. The Lillingtons do what they do as well as anyone in the business, taking a well-worn aesthetic and simultaneously treating it like holy writ and breathing new life into it. The Too Late Show doesn't disappoint. It strikes a balance between the band's last two LPs, with the majority of its running time taken up by catchy-but-gloomy tributes to Cold War paranoia and B-movie mythology. The band really shines when they invoke the bright, major key gleam of Death by Television, on songs like "All I Hear is Static", "Mars Vs. Hollywood", "Vaporize My Brain", and "Stay Tuned." The comparisons to Death by Television are regrettable but inescapable: on their 1999 LP the Lillingtons exhibited a grasp of pop punk that could only be called scientific without ever sacrificing the genre's poignancy. On The Too Late Show, the science is still tight as ever: the minor key rockers are better than on The Backchannel Broadcast, where it seemed like the band was deliberately refusing to write songs like "I Need Some Brain Damage." But every band has an album that's the yardstick they're measured by, and the Lillingtons' looms over them like a gravestone. But The Too Late Show is a step up from The Backchannel Broadcast's somewhat disappointing spy movie cool (although there's probably many who'd disagree about the latter album). It's a good balance of the band's different sides, with some of their finest songwriting yet. And for the bubblegum true believers who treat Rocket to Russia like scripture, it's a breath of fresh air in today's comparatively mustard gas-choked landscape of sick mosh and misanthropy. Posted Oct. 26, 2006, 1:30 a.m.